These are beautiful! How much tissue paper is needed per flower approximately? Hi, I would like to buy tissue paper in spain, but I don’t really find nice ones, and the shipment from the UK is expensive. Do you know any way to get it at a reasonable price? 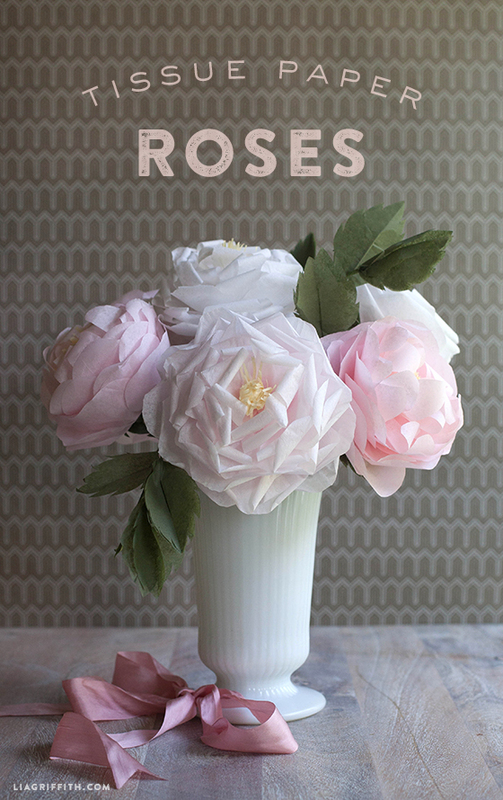 Do you by chance have an svg of the tissue paper rose template? My cutting machine is tissue paper capable. We don’t. Which machine cuts tissue? I would love to know. Love these! 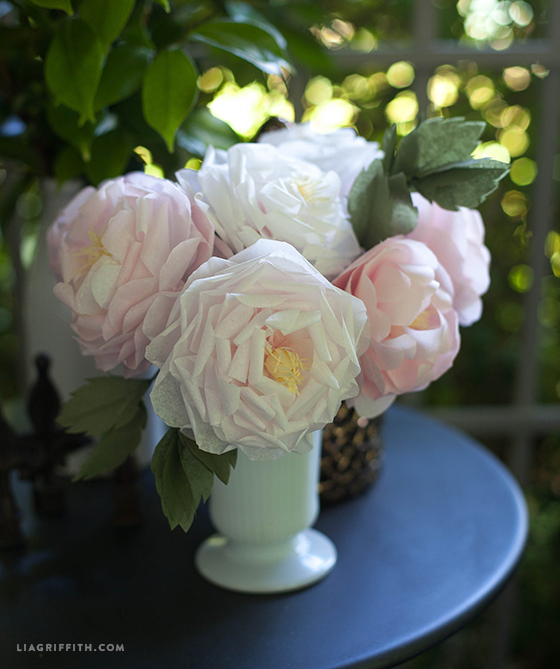 My very fave blooms are the giant fluffy cottage garden variety like peonies and ranunculus, and these are just perfect! 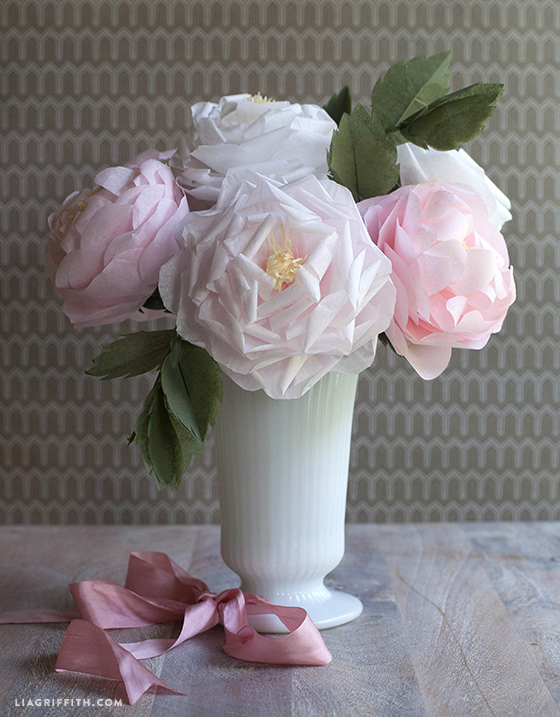 Question… every tutorial features these gorgeous milkglass vases and holders. Do you have a suggested source for faux vintage retro vases (cake stands, candlesticks, housewares etc) at reasonable cost? I find mine at Goodwill or other second hand stores. Спасибо Вам, очень интересный сайт. Hi there! these flowers are gorgeous! thank you so much for sharing…question: how did you change the color in the tissue? to go from pink to white? or is it just a lighting effect of the photo? thank you so much! I bleached the paper:) There are a couple of links in the post with more information on how to do it. You’re very kind to leave your free pattern, not all are like you!! Lia – you are so gifted. All the flowers I saw took my breath away!! Keep up the wonderful work to make us so happy!! These are fabulous! I have made 6 so far for my bouquet for my wedding! I after found this I no longer considered spending tons for money on flowers! I used regular ol’ tissue paper from my local craft store and they are so elegant. Thank you for this amazing idea! Mine look slightly different but just perfect for my wedding and made by me! I LOVE it Mel! These are one of my favorites. They look soooo real. Please share photos of them sometime. It is so beautiful I love it. I looked at your dresses from Xerox and the ones you made later, and they are beautiful!! I can’t believe one of your dresses was in an ad!! You have a talent and I’m glad I can enjoy seeing what you do. She also made two piñatas (I’m from Mexico so we must have one every birthday party) one was a house I think there’s a picture around too and she also made a big airplane!! They were so beautiful that people didn’t want to brake them haha. You came from talent then. I love making piñatas and have a flower design coming up this summer. I hear you about not breaking. . . they are ART! Unes flors precioses i encara llueix més amb la teva filla, tan bonica!! I adore your flowers & recipes!!! Just amazing, Lia… they look like real flowers. 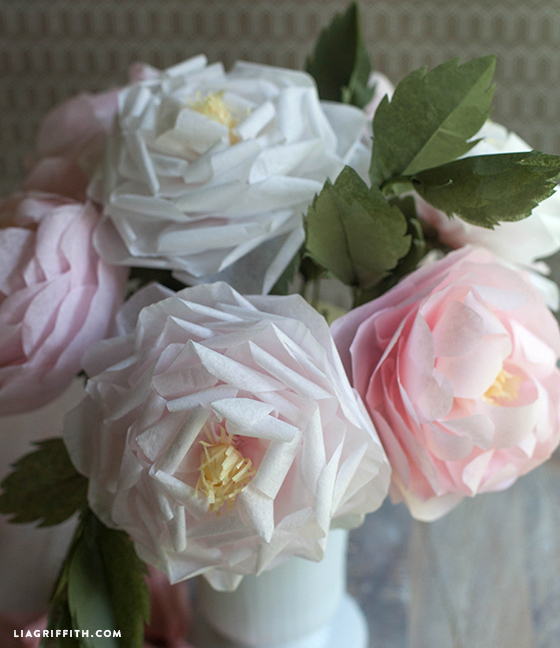 I don’t think I can make these, because the tissue paper you have used seems to be more sturdy than the one found in my country, but it’s worth give it a try. Thank you for this beauty. Give it a try with what you have. This is quite thin tissue. The curling and twisting gives it some extra body too. Lia, there’s something wrong with the PDF file? 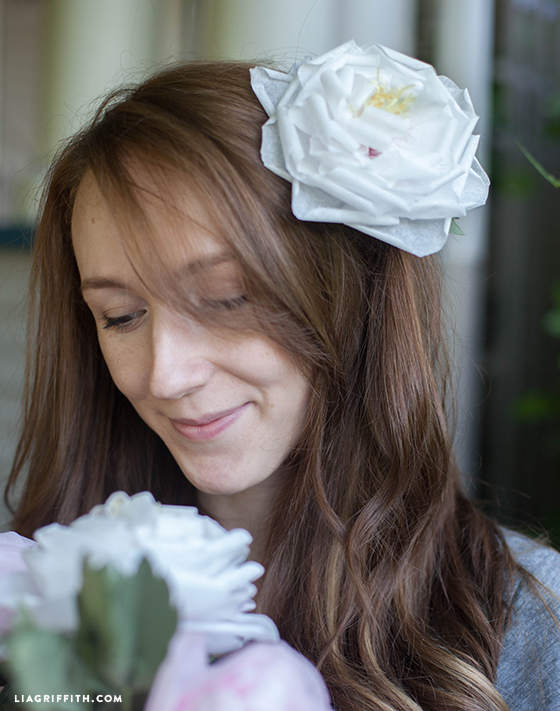 and I’m gonna make these beautiful roses, thanks! This seems to happen every week! Gads! It is working now.